I think we all understand the emotive human desire to spend the holiday season with our loved ones and the people that are closest to us but unfortunately it isn’t always possible to share the festive season in person with those who matter most. Apple’s latest iPad and iPad mini TV ad that has just surfaced today shows that the company not only understands that we can’t always connect in person with the important people but that the 9.7 and 7.9-inch tablets make great digital companions that can act as a gateway to the people we love through the FaceTime protocols. The latest TV commercial has been given the "I’ll Be Home" title and features a smiling young girl singing her favorite Christmas song to her grandpa with the help of a rather tuneful song. 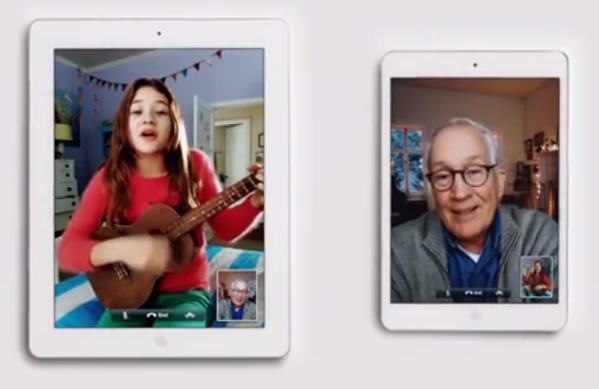 The cute girl is shown using a full-sized fourth-generation iPad to capture her dramatic activities with the grandpa sitting in the comfort of his own home preferring to accept the FaceTime conversation through the relatively new iPad mini hardware. Regardless of the hardware, the ad has been created to invoke an emotional reaction in us as we can all relate to having absent loved ones at this time of year. The new commercial lasts for a mere thirty-seconds and features no interruptions or additional Apple products being pushed to the viewer. Nor does it contain any third-party application advertising or any voice over or commentary. The Apple tradition of featuring a simple white background with real people and letting the product speak for itself has been conformed to once again and this ad is nothing more than thirty-seconds of good old holiday cheer. Granted, it has been created to help sell iPads during the holiday season but I love its simplicity and it makes me want to buy another iPad for a family member so it obviously works. Although Apple’s FaceTime technology is nothing new, it does seem to fit in perfectly with their approach of showing products like the iPad, iPod touch and iPhone to be hardware that allows family and loved ones to connect. The recent power of Apple’s advertising has been in their ability to get an emotional reaction out of consumers and that seems to have been achieved yet again with this latest ad.